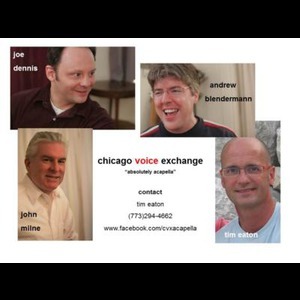 An acapella staple in the Chigoland area, and three-time winners of the Midwest Regional Harmony Sweepstakes (and a near miss for an Olympic Bronze in Synchronized Swimming! 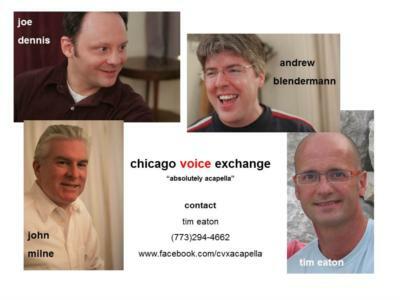 *), chicago voice exchange have been entertaining and confusing audiences for over 18 years. From Cubs and White Sox games, to corporate and school events, from low brow to high—their insouciance and self-deprecating humor leaves a trail of smiles and broken dishes wherever they go (once-- after which they are often banned). They've been featured on national and local television and radio, including WLUP and WGN, and have entertained groups as widely varied as local elementary school students, and guests at The Broadmoor Country Club in Colorado Springs. With their comedic twists on familiar songs and their creative originals, CVX are sure to connect with every audience. Please note chicago voice exchange will also travel to Cicero, Berwyn, Oak Park, Forest Park, Hines, Lyons, Riverside, Brookfield, Maywood, River Forest, Summit Argo, Carol Stream, La Grange Park, Bellwood, Bedford Park, Melrose Park, Westchester, Burbank, Bridgeview, Hillside, Hinsdale, Hometown, La Grange, River Grove, Stone Park, Western Springs, Berkeley, Franklin Park, Justice, Norridge.